Each Monday a brief motivational message is posted focusing on a single sales or business building skill, along with a single action point, for individuals to use during the week to help develop this skill into a regular habit. Take just a few minutes to change your week. Why is it some people seem to win all the time? I was ready to make my first fortune in high school when I ordered a book in which the author promised they would reveal to me their secret of success, why is it some people seem to win all the time and how they made their fortune. The promise was, if I just copied them, I could do it as well. The message? Write a book like the one I had just ordered and sell it to other suckers like me. I must admit to being a lot disappointed. While I have moved on, I don’t think I will ever stop looking and being tempted by the get rich schemes. What is really sad, however, is millions of people still think that ‘if only’ they could uncover the secret they could earn big without needing to work. I was inspired by my super fit 20 something nephews to get off the couch and made a commitment in January to complete the ‘couch to 5K’ running program. Being on the wrong side of 60 I had a lot of skeptical people around me, especially since I was seriously overweight and could only run a few steps before being puffed out. As I run and my body gets close to its physical limit I get tempted to stop and give up. When this happens I remind myself of today’s goal and how far I have come and I manage to stay the course. The key, of course, is a carefully planned program with achievable goals. If I set my goals too high and miss one or more of my goals my motivation plummets. Here I am in week six of a nine week program. Yesterday I managed to complete my first non-stop 3km run. I can feel the difference in my health, my mental ability and stamina in general and look forward to achieving the planned result. I have always been intrigued by the long running Punic wars between Rome and Carthage. Hannibal decided to end the war with one big and decisive battle. He took his armies and thirty or so elephants the long way around to Italy planning to conquer the Roman capital. The Roman counter strategy was to engage Hannibal in many smaller battles on the way. While the Roman’s lost every one of these smaller battles, Hannibal was so weakened he did not have the strength to conquer the Capital and despite winning every battle lost the war. I re-examined every aspect of the sale and concluded everything had been done correctly. We were just being challenged by a big player wanting to win without doing the right preparation. As we went into the meeting I reminded Wayne “You are not to talk about technology or price, only about his business and the results he will get following our plan.” We were given 90 minutes, 60 minutes more than we were allocated, and by the time we arrived back in Australia the CEO had already called Wayne to talk about another potential project. This was a ‘big break’ for me. The big break was a result of doing what I do in my running program, focusing on doing the right thing every day. By taking the time to develop the right muscles, the right experience, the right knowledge, the right relationships and the right character you may not win every battle, however, you can achieve remarkable things. If you are always looking for the easy way, the big break or get-rich-quick outcome life and success can easily pass you by. Read, or listen to the audio, of at least one chapter of a business or sales book every weekday. By doing this you will develop the habit of being a lifelong learner and within three years you will have the equivalent of a sales or business degree. Set yourself daily, weekly and monthly goals and celebrate every win. Share the wins with your colleagues and business people around you generating an enthusiastic team. Sun Tzu, in his book ‘The Art of War’, says “Excellence lies not in winning every battle, but in defeating the enemy without ever fighting“. Take the time to develop your skills and do the right things in life. the effort is well worth it because it will yield to you the ability to surmount any obstacle that comes your way. In the end others will point to you and say “Look at her – she made her fortune overnight” and you will smile knowing the effort it really takes. Australian business and sales leader, as well as author, who brings to life the science of human behaviour and motivation. Where influencing others decisions and their behaviour is critical to success I bring new and innovative tools to make this happen. Passionate about renewable energy and creating finance solutions to help businesses implement sustainable energy solutions. 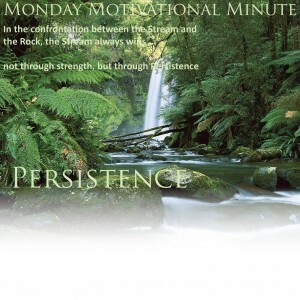 This entry was posted in Monday Motivational Minute and tagged goals, persistence, planning, sales. Bookmark the permalink. Business and sales leader, as well as author and blogger, who brings to life the science of human behaviour and motivation. Greg is a graduate from Newcastle University and a lifelong student of the sciences unlocking the complexities of human behaviour. With 30 years operational sales and management experience he brings resources and a wealth of practical ideas when influencing others decisions and their behaviour is critical to success.